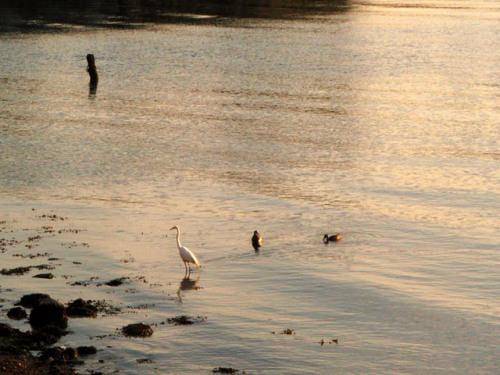 ← Jamaica Bay Restoration with Hour Children and American Littoral Society! NYCDEP Discovers a Major Source of Hallets Cove Bacteria! 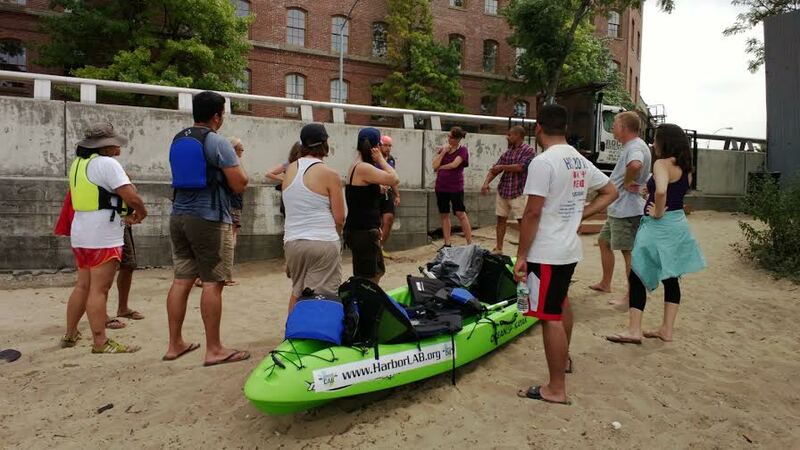 HarborLAB brought Hunters Point Community Middle School teachers by kayak to meet with Socrates Sculpture Park, which administers Hallets Cove under an agreement with NYC Department of Parks and Recreation. HarborLAB also delivered oysters to the neighborhood for the Billion Oyster Project. The NYC Department of Environmental Protection has discovered that one of the NYC Housing Authority buildings on Hallets Point has been discharging untreated sewage into Hallets Cove. About 140 people live in each of the 22 buildings of the Astoria Houses. The discharge was revealed when the DEP put blue dye into the system and observed the dye entering the cove, a method for which HarborLAB has long lobbied publicly and in private meetings with the NYCDEP. We’ve been the leader among boating groups in lobbying for water quality improvement at Hallets Cove and are very grateful for the NYCDEP’s extra efforts, despite many other obligations, which produced this great new progress. We also thank NYCHA managers for requesting additional testing of its systems, which directly led to this new knowledge. Further testing, as promised by the NYCDEP, must be done. This first clear identification of a contamination source, however, is a great start. HarborLAB looks forward to providing educational and fun programming at Hallets Cove if water quality there vastly improves. HarborLAB is also grateful to Howard Hemmings through the NYCHA Green and Gardening program, who took our concerns seriously and relayed them through official channels, and to Astoria Houses Residents Association President Claudia Coger, who first informed us of sewage backups and related health concerns there. We also thank Vanessa Jones-Hall, also an official with the residents association, for being a steady conduit of communication. HarborLAB volunteer and western Queens environmental leader Lynne Serpe introduced HarborLAB to these community partners. We’re also grateful to former NYCDEP Associate Commissioner for Public Affairs Matthew Mahoney, now with United Water, who first suggested dye testing. Preliminary findings by NYCDEP investigators, at Mr. Mahoney’s request in 2012, were that dog and bird feces might be the culprit (much was seen), as it often is throughout the country. Water tests further from shore, in greater depths, were less worrying. We must still test for non-human sources of contamination. In early September, HarborLAB stepped up its efforts to address the Hallets Cove issue by pushing for a meeting with the NYCDEP. We wanted to both put Hallets Cove on the front burner and to rebuild some lost public confidence. 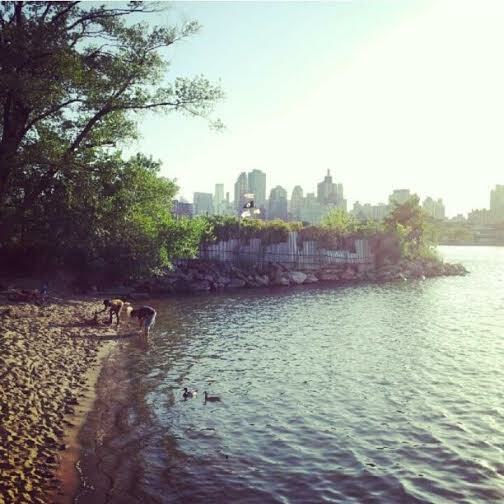 Responding to information from HarborLAB, NYCDEP also invited the NYC Water Trail Association, which coordinates regional water sampling by volunteers. At the meeting the NYCDEP agreed to do more testing in partnership with HarborLAB (sampling in the off-season of late autumn through early spring), whenever possible including the CUNY students we serve. Interestingly, the NYCDEP agreed to also sample sand, to determine the species of bacteria, and therefore hosts, an even more exciting educational opportunity. Sand has only recently been more adequately recognized as a growth medium for bacteria and a transport mechanism. Results and program details will be released in the spring. Erik – On September 22, DEP personnel responded to a request from management to inspect the sanitary drains in the Astoria Houses. They discovered uncapped drains that were allowing sanitary flow from one of the buildings to enter the storm sewer and discharge into the cove. This was confirmed by means of a dye test. They issued a Commissioner’s Order for the condition to be corrected (within 30 days), and a follow-up inspection will be made to confirm that the work has been done or the Houses will be issued a Notice of Violation to be adjudicated before the Environmental Control Board. Children playing with the sand at Hallets Cove. Public boating may have encouraged a false sense of safety at the cove, where bacteria counts are high. Photo by HarborLAB volunteer Audrey Dimola. HarborLAB has for its existence opted to not provide children’s programming at Hallets Cove because intestinal bacteria counts in its near-shore waters were alarmingly high, even in dry weather. Normally such elevations are caused by combined sewer overflows when it’s raining. Runoffs from streets force engineers to open sewer gates, rather than have fouled water back up into neighborhoods, because rain and toilets go into the same pipes and treatment plants. HarborLAB initiated weekly water sampling at Hallets Cove as part of the NYC Water Trail Association’s “Citizen Science” program, coordinated by Rob Buchanan. Testing was done at The River Project and LaGuardia Community College, and Riverkeeper provided great public outreach. Bacteria counts were so high and sustained that HarborLAB Founder Erik Baard called for children’s programs to be suspended at Hallets Cove until the problem was identified and addressed. That we saw high bacteria counts in dry weather told us that even occasional favorable results from weekly sampling on Thursdays were meaningless as a guarantor of public safety on weekends because without knowing the source (not rain) we couldn’t know when contamination would spike again. Erik also founded the LIC Community Boathouse, which continued with children’s programming at Hallets Cove. Some doubted the reliability of the sampling and redundantly sampled Hallets Cove (we later withdrew from that activity rather than be wasteful or political), but received similar results. For years, HarborLAB has lobbied for green infrastructure, dye testing, and other innovative measures at Hallets Cove, which should be a safe destination for educational recreation in a habitat restoration. We still believe that Hallets Cove should have the agreed upon extra testing and should be a showcase for green design and clean-tech innovation. Waterfowl at Hallets Cove. Photo by Erik Baard.